The Latin American Program of the Auschwitz Institute for Peace and Reconciliation launched the first training initiative on the prevention of genocide and mass atrocities developed jointly with a university in the region. 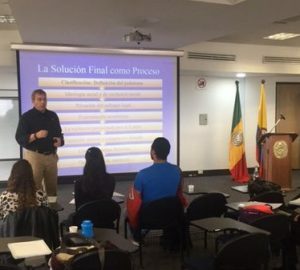 Organized in collaboration with the Faculty of Finances, Government, and International Relations of the Universidad Externado de Colombia, the Course on Early Warning Mechanisms and Public Policy for the Prevention of Mass Atrocities was conducted between September 14 and 17, 2016, in Bogota, Colombia. The course, which was not only offered to those in the academic sphere, but also to public officials and representatives of civil society, consisted of 32 hours of instruction involving the collaboration and participation of the United Nations Office of the Special Adviser on the Prevention of Genocide (OSAPG). The curriculum provided an opportunity for reflection as well as the circulation of materials related to the importance of training in human rights and the prevention of atrocities for actors in different spheres of society who are committed to the proposed approach. The program included presentations by a diverse set of high-profile instructors involved in work relevant to the themes of the event. These instructors were drawn from the faculty of the University, representatives from civil society, and from several State institutions from the region (Peru, Uruguay, Colombia, and Argentina). Additionally, the course incorporated three modules taught by Dr. James Waller, AIPR’s Director of Academic Programs, and a visit to Colombia’s Center for Memory, Peace, and Reconciliation. The course, which allowed for the concepts of genocide and mass atrocities to be developed from a historical point of view, also involved participants in a review of related international standards. 4 thematic modules, dedicated to analyzing concrete avenues for action relevant to prevention in Latin America (transitional justice, the fight against discrimination, educational policies, and challenges in interinstitutional work), were included in the curriculum. The Auschwitz Institute is honored to have shared this opportunity for training and reflection with the prestigious Universidad Externado de Colombia, especially during this particular moment in which hopes are set to be fulfilled through an irreversible process towards peace.